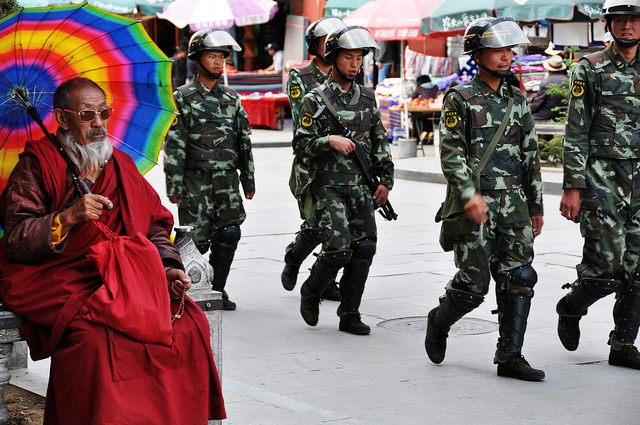 (TibetanReview.net, Feb09’19) – Chinese ruled Tibet is the second least free country or territory in the world, ranking next only to Syria, according to the US-based rights group Freedom House in its Freedom in the World 2019 report which was released on Feb 4. Tibet scored just one point out of 100 while Syria was at zero. China itself has done relatively better but still with an abysmally low record of just 11 points. The rights group’s flagship work annually evaluates the condition of Political Rights and Civil Liberties around the world. Countries are given a numerical score and ranked. It currently evaluates 195 countries and 14 territories and categorizes them as Free, Partly Free, and Not Free. While both Syria and Tibet have scored 7 out of 7 for lack of Political Rights and Civil Liberties, China itself has earned 7 for lack of political rights and 6 for lack of civil liberties. Countries and territories are then given aggregate scores, with those getting 0 being recognized as least free and those getting 100 as most free. The report found a total of 49 countries to be Not Free, representing 25 percent of the world’s polities. The number of people living under Not Free conditions stood at nearly 2.7 billion, or 37 percent of the global population. And more than half of this number lives in just one country: China. The number of countries designated as Free stood at 88, representing 45 percent of the world’s 195 polities and more than 2.9 billion people—or 39 percent of the global population. Freedom House said its flagship report had recorded global declines in political rights and civil liberties for an alarming 13 consecutive years, from 2005 to 2018. It added that the global average score had declined each year, and countries with net score declines had consistently outnumbered those with net improvements.